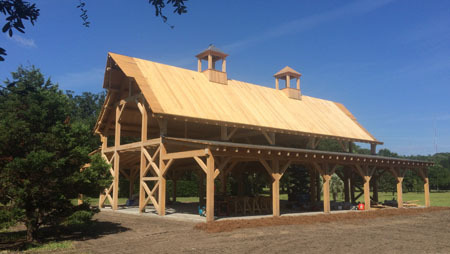 This timber frame barn was built for a location on the coast. The exposure loads were great considering it is very close to the coast. Designed, Engineered, and Built to withstand 150 mph winds for 3 second gusts. The barn is the monitor style with two flanking sheds on either side of the main frame. There are also two lofts on each end of the frame. The cupolas were also built by Fountain Timberworks. 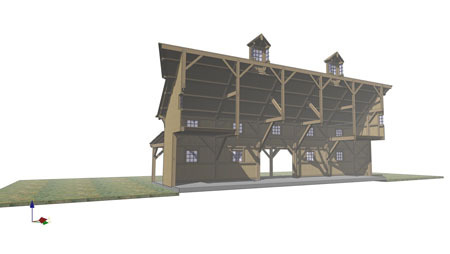 Please inquire with Moyer about timber frame barns. These trusses were installed high in a great room. The trusses are of Cypress timber with mortise and tenon joinery. This is the second project in conjunction with Marc Camens and Bennett Custom Homes. 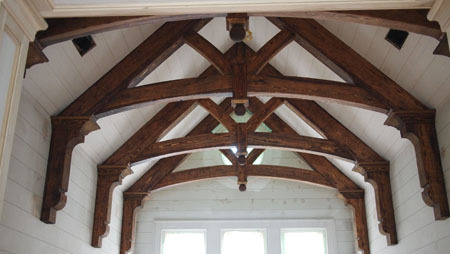 The finished product was to made to look as if the beams were reclaimed. To that end we used a process of fire to give the timbers a more reclaimed appearance before finishing with a penetrating oil. As most of our projects we crafted all of the assemblies in shop. 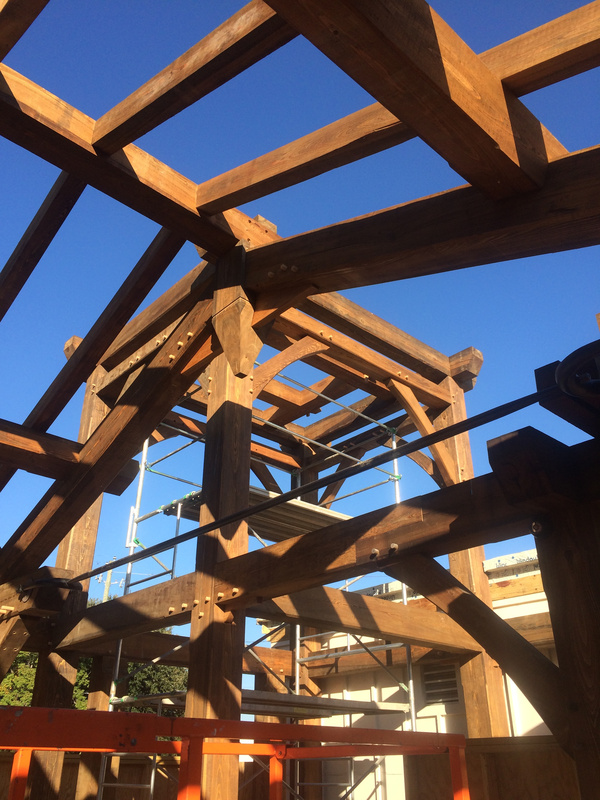 We installed the four trusses and eight corbels in 2 days on site. 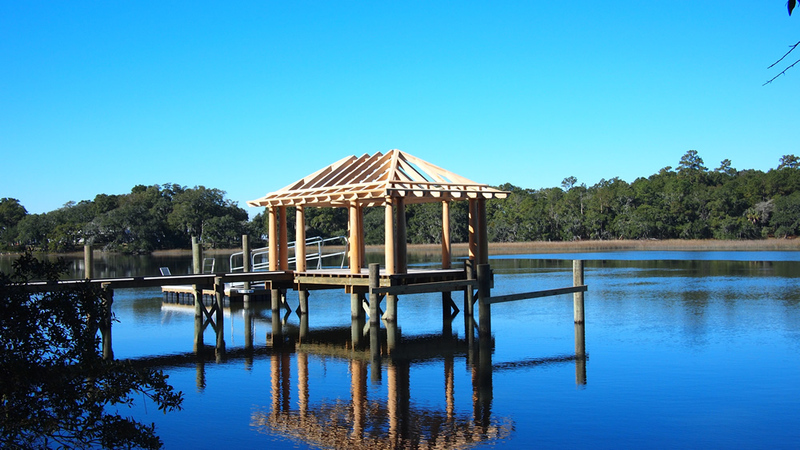 In a collaboration with Gibson Architects, Fountain Timberworks designed the timber roof and built the dockhouse from the deck up. The inspiration was drawn from a English garden structure the client had visited. The frame is anchored with knife plates and has housed jack rafters. A nice dockhouse for a beautiful setting. 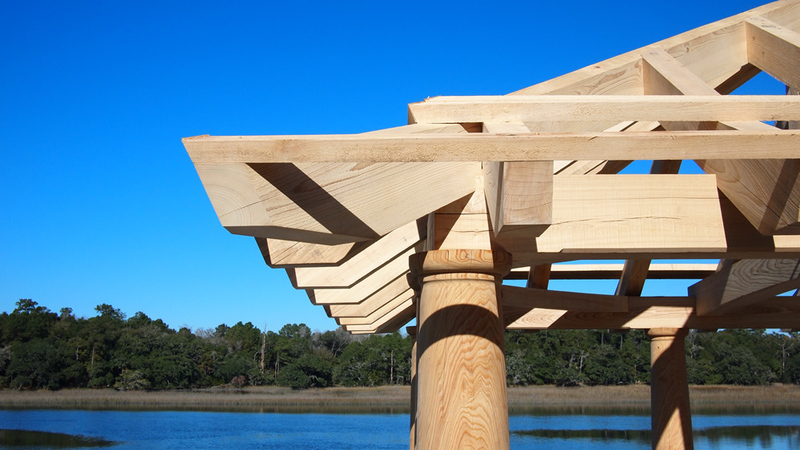 This porch was built in our shop in Charleston of Atlantic White Cedar (aka Juniper). 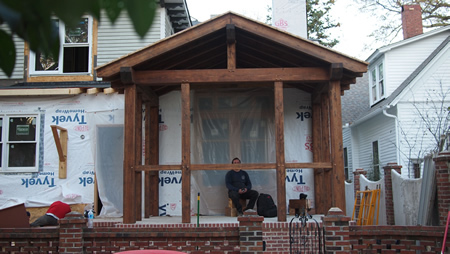 We prefit and labeled the structure, then trailered it to Greenville where we raised the porch and installed a cedar roof deck in 3 days. 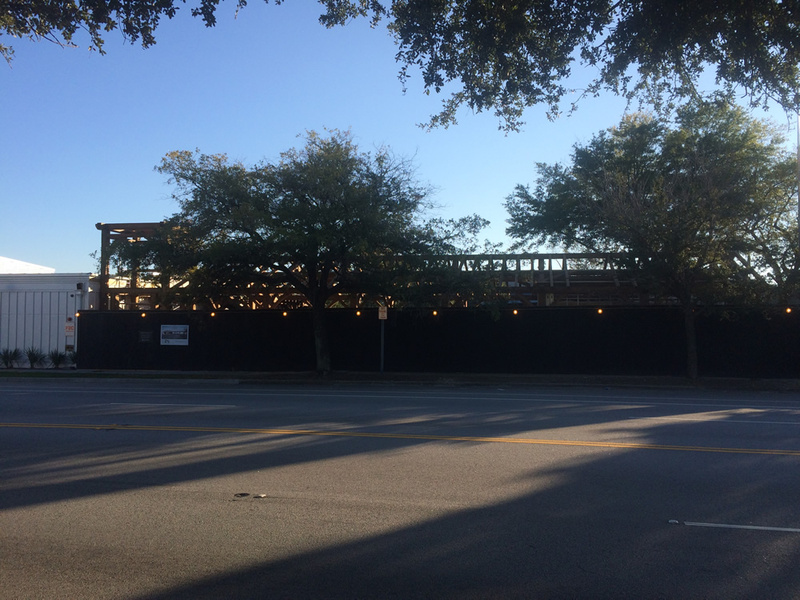 The timber frame is located in the Historic Hampton Pinckney District. One of my personal favorites. 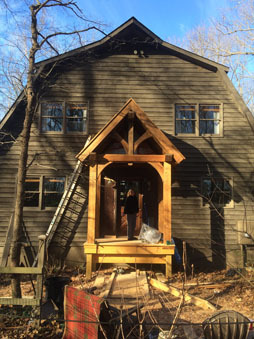 This entryway mimics the heavy timber inside the gambrel. Lighting service was accounted for while building on sawhorse to create an easy situation to light the entryway upon completion. Radial curved kneebraces, through tenons, v notch cypress decking. Some say it looks wise. After much waiting, this fine frame is finally raised. 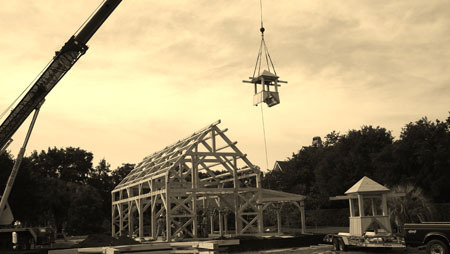 Fountain Timberworks' skilled crew raised the main frame in one day with a 60 ton crane. 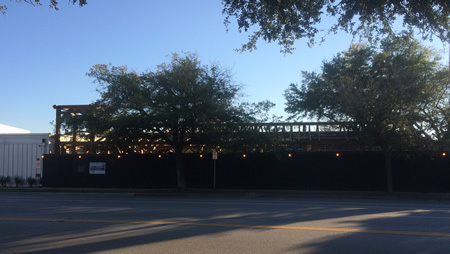 The pavilion which is just adjacent to the horse track needs it brick floor to be complete. 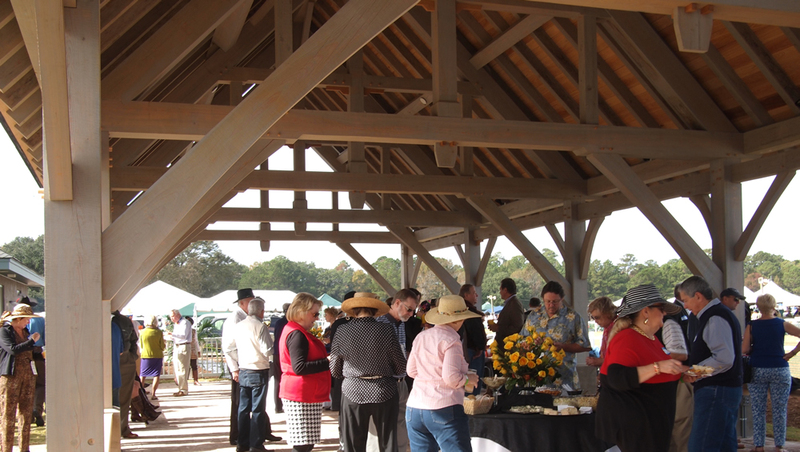 The Charleston Cup horse race is on Nov. 10 2013. 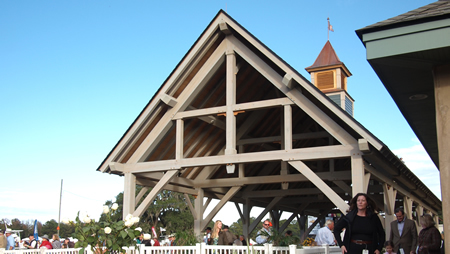 We hope that people in the equestrian community see this frame and wish to have a timber frame stable or barn! We would love to do this type of work! See you at the race. More pictures coming soon! 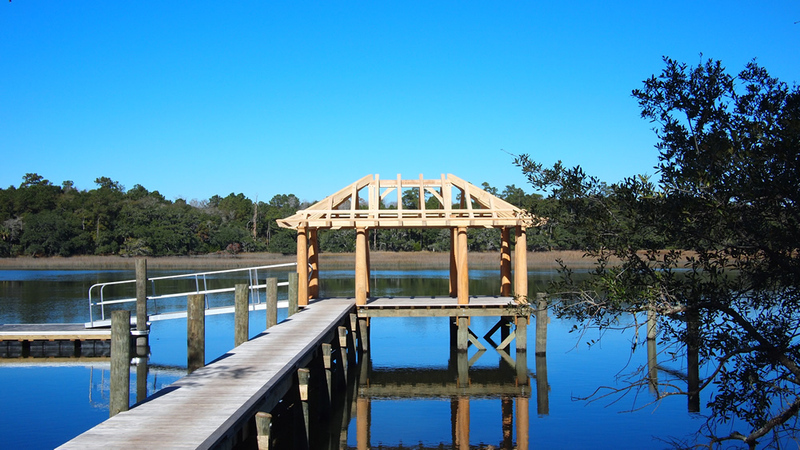 In progress in all of the custom millwork bracketry for a new home on Daniel Island. 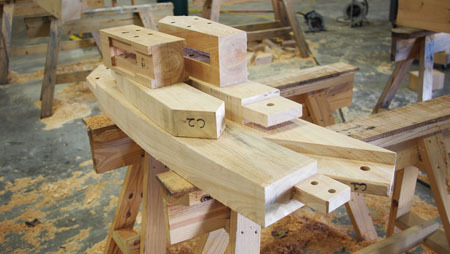 In addition, a timber frame cedar entryway is built in shop awaiting raising to happen very soon. Check back in the portfolio for pictures of completion. Fountain Timberworks is pleased to have worked with Roy Mahshie of Mahshie Custom Homes on this project. Thanks to Darryl Cobb of Cobb Architecture for a really nice entryway design. We are proud and excited to have secured a job with Bennett Custom Homes. This job entails working with irregular reclaimed long leaf pine beams provided by Reclaimed Designworks. There are two rooms that will receive the timber. One office with a half octagon, two valleys, and an intersecting gable. The other is the great room with four kingpost trusses. Onward! This project involved reclaimed Oak that was resawn to a surfaced finish. Very nice timber. We recreated a kitchen and living room to appear as if the beams were an inherent and integral part of the structure. I will get pictures to post soon when I go back to install a mantle. This was a neat project ot work on. It is a finely designed home by Tyler Smyth. This timber work could be classified as contemporary work due to the fact that the joinery was far from traditional. However, it worked nicely to promote raising ease and was strong due to its use of spline joinery that was concealed at the gutterline. The scope included a four posted entryway and a back elevation that supported the roof and composed a porch. The material was s4s green Cypress timber. This residence was a great timber frame project. Technical difficulty meets art. From conical roofs to arched trusses, to unequal octagonal roofs, to breezeways that connected two buildings. 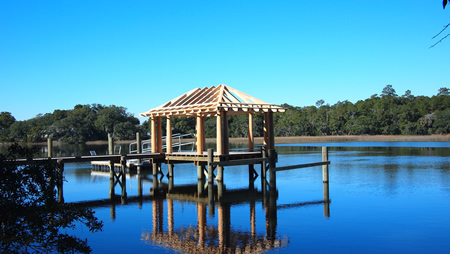 Materials were old growth Cypress from the Cape Fear River Basin in North Carolina. An ebony oil was applied to both the timbers and roof decking as well. 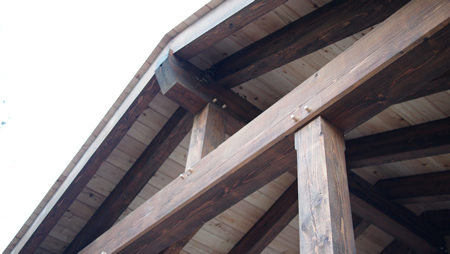 This project involved full design of the timberwork, production, and installation. All phases were on time and on budget. 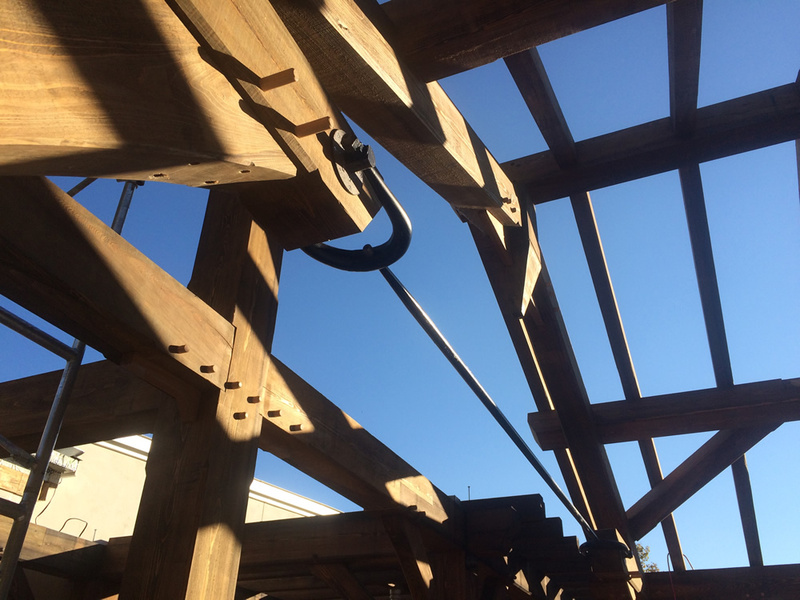 The breezeway like all of our timber frames was cut in shop and then raised on site. The challenge with this frame was that it connected both the carriage house and main house. These two structures were being built at the same time. 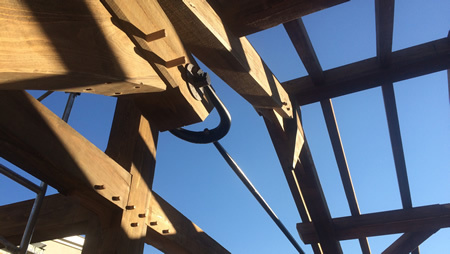 Any variance in measurements had to be accounted for in the timber frame. The roof of the breezeway had a shed roof intersecting a hipped gable. Our breezeway also connected to a garage cover. In all there were 321 timbers in this structure. Key elements included detailed braces and keyed scarf joints. This porch included two intersecting gables with one gable terminating into a cone roof. 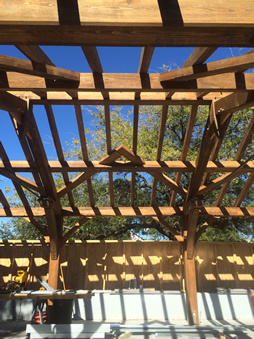 The structure includes arched trusses and principal purlins with common rafters. A significant boss pin receives all of the half arch members. The boss pin was a 20" X 20" rough Cypress timber that was shaped into an octagonal cross section. Other key elements are curved purlins in the cone roof plane as well as braces in double curvature that go from post to plate. The posts were locked town with Timberlinx and sat upon 3" granite plinth blocks. The Poolhouse was built out of old-growth cypress timber due to its great resilience as a wood in the outdoor environment. The frame was an octagon that converged upon another boss pin. The sides of the octagon were not of equal length creating two different pitches in the roof. Our frame met a stone bathroom area. Exposed timber rafter tails around the bath house met conventional 2X framing that would never be seen. This allowed the entire poolhouse to keep the same aesthetic. 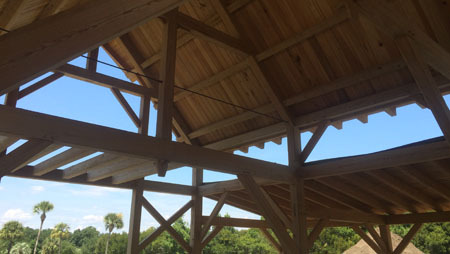 Key elements are vaulted struts and clear spans. Our Cadwork software is a powerful program. It is an efficient design program that communicates in both 2d and 3d. We can also produce lists for optimal material ordering. These optimization reports can create less than 3% material wastes that save cost. These efficencies also save resources. 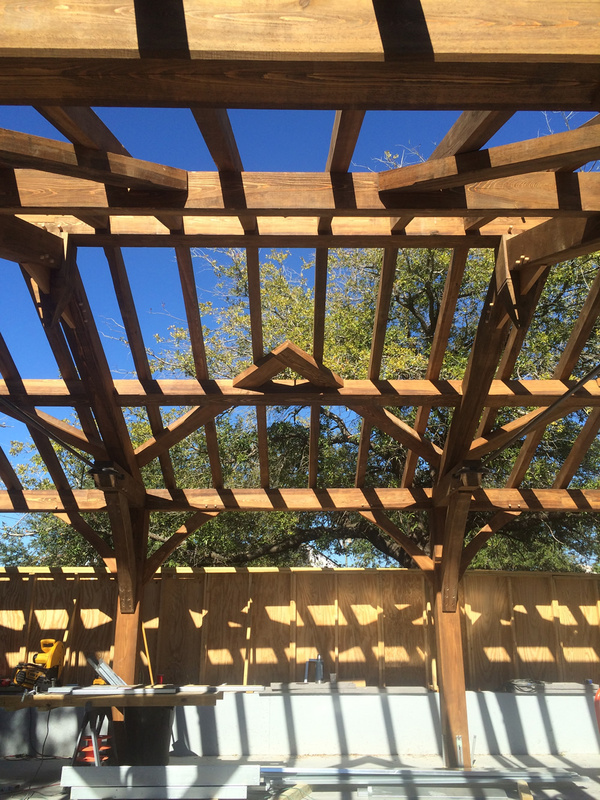 Fountain Timberwork's Working Drawings Service can be beneficial to timber frame shops that are having to deal with complicated framing situations, to Architectural firms that are dealing with specialized framing, as well as to others in the building industry. We prefer to work with architects early on in the process to create the best relationship between the timberwork and the other architecture. 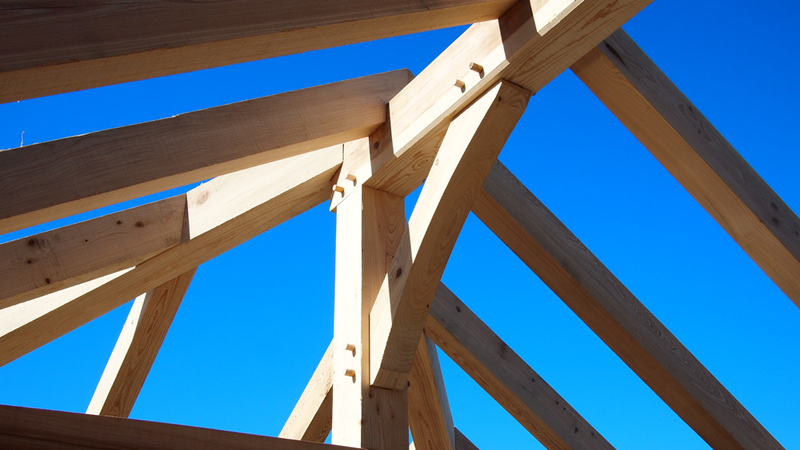 With given parameters, we can design the timber frame or timber frame elements entirely in house. These drawings can then be added to the firms drawings for the bidding process. Our Zephyr Summerhouse is described in full on the Products Page. New styles of Summerhouses are in development. Please inquire about special deals with being the first customer of a new design.